Back in the day, a barber was considered a community mainstay. Not only a place to get a haircut, the barber shop, along with the post office was considered to be the place for news and gossip in small town America. After all, keeping the mane trimmed is one of those things any civilized person did, so everyone ended up there once every few weeks. Historically, the work of the barber also included some medical treatment in the removal of rotten teeth and the letting of blood through the use of leeches. Today, only the hair aspect remains, and even that is a limited license compared to that of a beautician. Luckily for the barber, becoming one is significantly easier than becoming a beautician. Given barbers are typically sole entrepreneurs, the standard approach of gating employment through the use of credentials simply isn’t feasible. To that end, barbers are licensed professionals. An old and noble profession, when the government began to take hold of the requirements to become a barber, it was done by the state government and not the national government. This is because, in the old days, the state was given far more power to leverage such things than they do now. As a result, the profession is not centrally governed and there are effectively fifty different sets of requirements for being a barber. They do share some common points, however, making distillation of these fifty rulesets into a central list quite feasible. The nature of the barber keeps it separate from that of the cosmetologist. While the barber is associated with the masculine dressing of hair, including shaving, the use of various tonics, and the creation of wigs (think 1700s here! ), a cosmetologist is associated with a more feminine slant and is uniquely licensed to do perms. The difference in requirements is seen at nearly every barber shop there is. Given the barber gets it easier when it comes to education, it’s just cheaper at the barber shop! To illustrate this, the primary requirement for becoming a Master Barber in the state of Tennessee is 1500 hours of training in a registered barber school or 750 hours of training in a registered cosmetology school with a Cosmetology License. Other than the aforementioned barber school requirements, becoming a master barber is incredibly easy. Given there is no need for book learning in the profession, but rather dexterity and good old fashioned practice, a high school diploma is not even a requirement in many states. Instead, 10th grade education appears to be the norm. A prospective barber who meets the barber school requirements must typically pass an exam created and maintained by the state, such as this linked examination page for the state of Texas, with some states requiring two or more exams. Invariably, this license must be renewed every two to three years, bringing with it a reasonable licensing fee that keeps the state regulatory body solvent. 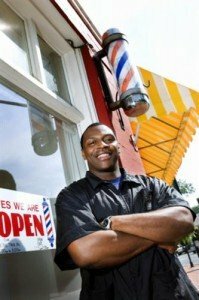 Unique licensing requirements and the ability to make a profession out of something that virtually every person needs, haircare, makes the profession of barber a solid choice for those looking to meld social aptitude and dexterity into a profitable career without having to resort to the credential-filled and bureaucratic nightmare that is medicine. Still retaining a state-based licensing system and the wide open feel of the good old days, the profession draws to it those who feel acclimated to the slightly slower days of yesteryear. After all, there will always time for you, the barber, to talk with your client when they’re stuck in your chair for twenty minutes.